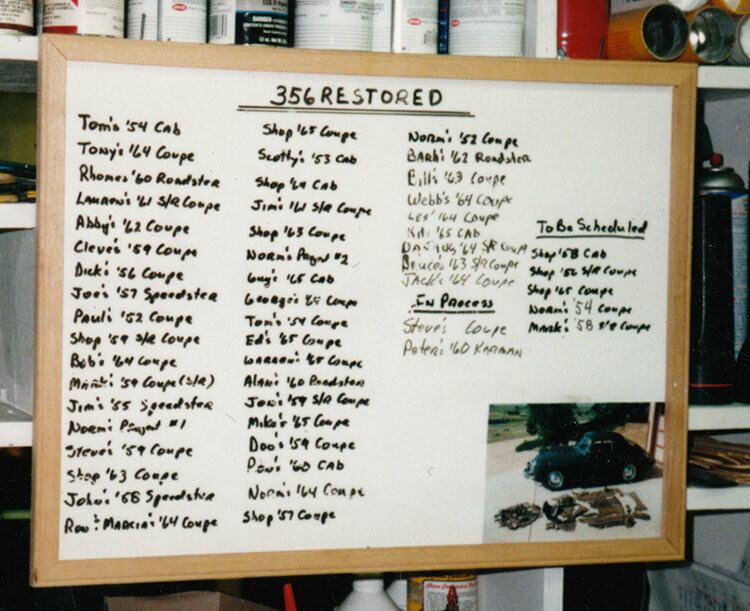 Each 356 has a story to tell! This is a photo of a white board in the shop. We ran out of space and comments on completed 356s. You can read more details in the following posts. He had it “restored” in Kansas City. They did a terrible job and gave it back unassembled. Thirty years later he brought it to us for a correct restoration. Rather than Silver/Black we are going to the original Black/Green. Should be stunning and will be for sale. She talked us in to restoring the family 356 by sending us pictures of her cute triplet girls saying they wanted to ride in the 356. BJ called this the”Goat Car” as the goats had climbed up the back damaging the rear window seal and letting in the rain. One of the rustiest 356s we’ve done.